Wilson prepares students for entrance to graduate programs in law, medicine, veterinary medicine and the health sciences. In general, professional schools require a strong liberal arts background and a firm grounding in those disciplines in the sciences, social sciences, or humanities most closely related to the profession. A high proportion of Wilson graduates who apply to professional schools are accepted. Students interested in veterinary medicine are expected to have sound training in the sciences. Most students elect a major in biology or chemistry. Some may elect a major in Veterinary Medical Technology, although additional courses are required to meet prerequisites for veterinary school. 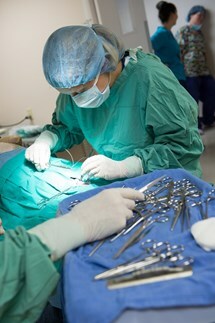 Veterinary school admission is based on: undergraduate cumulative grade point average (GPA), results of the Veterinary College Admissions Test (VCAT), and/or Graduate Record Exam (GRE), letters of recommendation from faculty and other personal references, a personal interview (if requested) and off-campus experience in community service or in the veterinary field. Requirements for entrance to veterinary schools vary considerably. Most schools require at least two semesters of biology, general/inorganic chemistry, organic chemistry, physics and calculus. Some schools also require biochemistry, genetics, microbiology, molecular cell biology, statistics, English composition and literature, and electives in humanities and social sciences. Interested students should consult with one of the pre-professional advisers. The pre-professional adviser will help the student with the selection of appropriate undergraduate courses, and offer advice about preparation for the VCAT exam and applying to veterinary schools. Medical schools prefer students who have a broad background in the humanities and social sciences as well as completion of certain specified courses in the sciences. Many pre-medical students elect a major in biology or chemistry, but a major in any field is acceptable. Results show that liberal arts majors attain the highest scores on the Medical College Admissions Test (MCAT). Medical school admission is based on undergraduate cumulative grade point average (GPA), results of the MCAT, and/or Graduate Record Exam (GRE), evaluations from faculty, a personal interview (if requested), and off-campus experience in community service or in activities relating to the medical profession. Students interested in studying medicine should take courses that stress logical and analytical thinking, written and oral expression, reading comprehension and the relationships among science, technology and society. The science requirements of most medical schools can be met at Wilson by completing the following courses: Biology 101,102; Chemistry 101,102,201,202; Mathematics 130,140; and Physics 101,102. These minimum requirements should be completed by the end of the junior year. Interested students should contact the associate dean for Academic Advising. The students will be referred to one of the pre-professional advisers. The pre-professional adviser will help the student with the selection of appropriate undergraduate courses and provide advice about preparation for the MCAT exam and applying to medical schools. Other pre-professional options in the health sciences include, but are not limited to: dentistry, nursing, optometry, pharmacy and physical therapy. Students interested in these or other health professions should contact the Associate Dean for Academic Advising for referral to one of the pre-professional advisers. In its statement on pre-legal education, the Association of American Law Schools has expressed the view that there is no “pre-law major.” Because law is created and applied within a political, social and economic context, law school applicants should acquire a broad liberal arts education to help them understand the place of law in our society. Law school admission is primarily based on: undergraduate cumulative grade point average (GPA), results of the Law School Admissions Test (LSAT) and evaluations from faculty. In addition, a personal interview (if requested), and participation in community and college activities may be considered by some law schools. Students interested in attending law school should take courses that stress logical and analytical thinking, written and verbal expression, reading comprehension and knowledge of government and economics. Courses in areas such as political science, philosophy, accounting, writing and literature, mathematics, sociology and economics are particularly useful. The pre-law adviser is available for help in selecting appropriate undergraduate courses and to offer advice about preparation for the LSAT exam and applying to law schools.